Fingerprint device maker SecuGen has introduced a scanner that’s compatible with SAP systems to provide biometric identity management and fraud prevention in conjunction with software from realtime North America Inc. 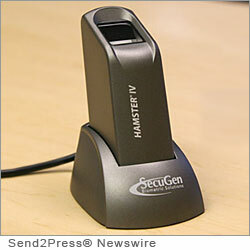 The SecuGen Hamster Plus and Hamster IV fingerprint readers work with bioLock software to give SAP users biometric control of system activities at varying levels of details. Users may place restrictions on information like financial transfers, confidential company reports and intellectual property. The biometric system can re-authenticate those who request access to restricted information or perform mission-critical activities. It also eliminated the need for a password. The two scanners feature Auto-On, a detection technology that automatically looks for the presence of a finger, which speeds the login process. The devices also feature Smart Capture, which helps with recognition of difficult fingerprints, including dry, wet, scarred or aged skin.